Find an SUV that suits your style with AMT Leasing. We feature a range of premium cars like the Volkswagen Tiguan for lease. Our Volkswagen Tiguan lease cars range from a front-wheel drive 1.4-litre petrol TSi to a spectacular all-wheel drive 2.0-litre petrol BiTDi with automatic transmission. The range is designed to offer something for everyone, whether you’re looking for an optimal urban drive or an off-road trailblazer. All of our Volkswagen Tiguan lease cars are comfortable and spacious, with firm suspension and plush materials on all seven adjustable seats. Enquire and find out more today, or take a look at our full range of VW lease cars. The Tiguan SUV crossover is an excellent choice if you’re looking for something powerful, dynamic, safe and modern. It provides a smooth driving experience with its soft suspension and excellent handling which comes as no surprise, given it’s 53kg lighter than the previous model. The Tiguan comes with a wide range of engines: three petrol and four diesel, and with a choice of manual or dual clutch automatic gearboxes and front or four-wheel drive. It’s comfortable and spacious with a large boot. The suspension can be altered to either a sports suspension which lowers by 15mm or outdoor suspension which raises the ride height by 15mm. The Volkswagen Tiguan is spacious with a 77mm longer wheel base, its wheel arches 30mm further outwards and 60mm longer. Its sharp defined shoulders and crisp crease bonnet combined with a radiator grille gives the Tiguan a sleek appearance. The new model amplifies comfort with its lower roof and dynamic chassis control which allows for adaptive damping and a progressive variable rate steering rack. The Tiguan offers a range of engines, from the 178bhp 2.0-litre turbo petrol to the 237 bhp twin-turbo 2.0-litre diesel. It also has a seven-speed dual clutch automatic gearbox. While driving, the Tiguan is quiet and gentle, ensuring a comfortable and relaxing driving experience. The interior of the Volkswagen is practical and well laid out. The seats are 8mm higher to give you a comfortable driving position and to allow you to enter and exit the car with ease. The boot is wide and deep with 615-litre boot space, which can be expanded to 1655 litres when the seats are folded. The Tiguan also offers an active info display with the option of a Head Up screen. 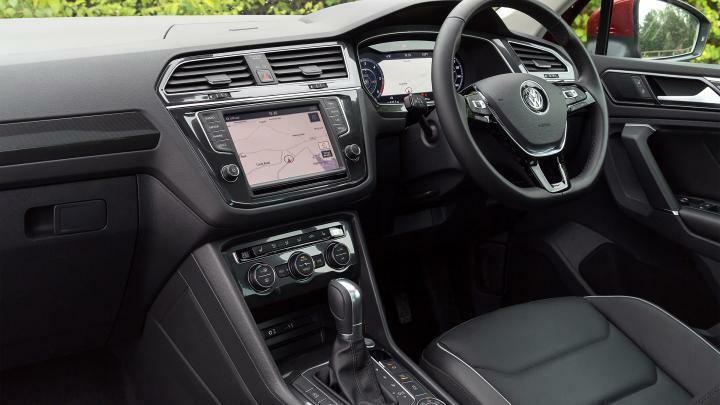 The entry-level Tiguan S comes with lane assist, pedestrian detection and city emergency braking, while some of the higher spec trims offer high-tech gadgets like an eight-inch touch screen Composition Media infotainment system, the VW Car-Net and App-Connect smartphone mirroring. You can connect your smartphone too via Apple CarPlay and Android Auto. The highest spec allows you to connect your tablet via WiFi to the cars infotainment system so those in the back can have control over the Tiguan’s infotainment. If you like the Volkswagen Tiguan, you may also like our deals on the Mercedes-Benz GLC, Audi Q3, and BMW X5.